Cover to the first paperback edition of of J.D. Salinger's The Catcher in the Rye. New York. The New American Library. 1953. Holden’s red hunting hat is like Linus’s blanket (Moore 163). 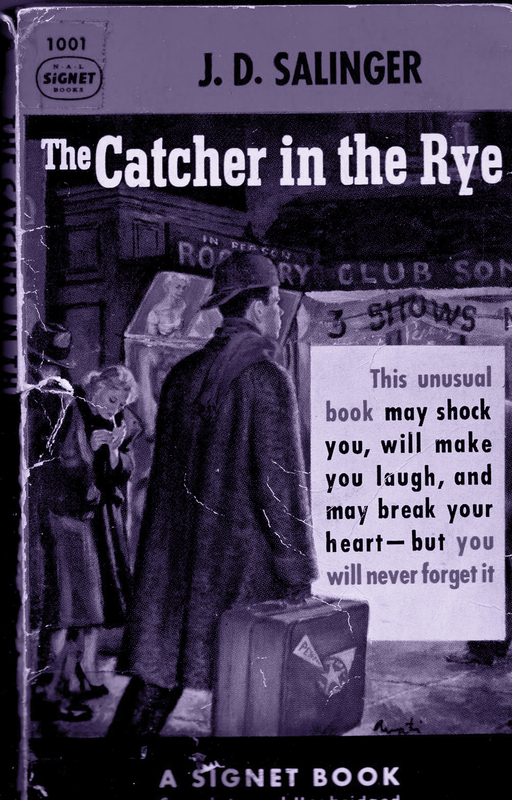 In The Catcher in the Rye, the obnoxious red cap “is inseparable from our image of Holden” (Chen 143). He sincerely values this accessory and is attached to wearing it, but Salinger does not provide a clear explanation for Holden’s fondness of it. Nonetheless, Salinger’s frequent references to the hat establish its symbolic importance. According to Bryan, “it becomes the most reliable symbolic designation of Holden’s psychic condition through the novel” (Bryan 1074). Holden purchased the hat in New York for “a buck” after losing the fencing team’s supplies (Salinger 22). Thus, this hat with the “very, very long peak” initially appears to be a simple form of consolation for Holden (Salinger 17). Critics agree, however, that an analysis of this symbol can provide an overview of the adolescent protagonist’s development as a character. On one level, critics interpret the hat as a display of Holden’s attempt to be unique and divergent from those around him. He prefers to wear the hat backwards “as a badge of his nonconformity and his rebellion against the rest of society” (Vanderbilt 297). Holden calls his hat “crazy” and Ackley says that Holden “got robbed” even though he only paid a buck for it (Salinger 205, 22). Despite how outlandish the hat may be, when Holden is putting it on he tells the reader, “I didn't give a damn how I looked” (Salinger 53). He often ensures, however, that he will not be seeing anyone he knows before he wears it in public. Holden says, contradicting his earlier statement, that he liked wearing it backwards because he “looked good in it that way” (Salinger 18). While he may not want to care about his appearance, he cannot help but to evaluate how he looks in the hat. This inconsistency between Holden’s claims and actions contributes to his immaturity. The need for development is a common characteristic among bildungsroman protagonists. As in The Catcher in the Rye, most novels of the bildungsroman genre begin with childlike characters—with inconsistent thoughts and actions—that must come of age as the story progresses. Holden resists his own development towards maturity and wishes for others to do the same. Thus, critics find significance in the hat being red. Both of Holden’s siblings, Allie and Phoebe, have red hair. By wearing the red hunting hat on his own head, he is identifying with his younger siblings and the innocence that they represent. Holden wishes “to retreat backward into the world he is leaving—that of childhood innocence—rather than advance into adolescence, maturity, and the world of adult American society” (Vanderbilt 298). Furthermore, by wearing his hat backwards, Holden resembles a baseball catcher (Strauch 10). This resemblance connects Holden to his dream of becoming a catcher of innocent children who come too close to the cliff at the edge of a field of rye. Furthering the connection between the hat and a catcher, Allie had played baseball prior to his death and “wrote poems in green ink on his baseball glove” (Vanderbilt 298). Though he wears it backwards like a baseball cap, the red hunting hat is a bizarre accessory for Holden, considering that he does not hunt in the conventional sense of the term. When Ackley questions Holden for wearing a deer-hunting hat, Holden corrects him, saying, “This is a people shooting hat . . . I shoot people in this hat” (Salinger 22). Therefore, Holden identifies the hat with his aggressive tendencies towards others, especially those of the adult world (Bryan 1074). As a protector of innocence, Holden often verbally attacks, or “shoots,” phony people who accept the artificiality and conventionality of growing up. Thus, the red hunting hat manifests Holden’s clinging to his childhood and his struggle to come of age. In the conventional sense, the bright red hat was intended for hunters as a means to keep from being shot (Bryan 1074). Hunters were supposed to use the hat as a form of protection. Likewise, Holden seeks his own form of protection by wearing the hat. It serves as “his pseudo-identity and gesture of escape from life” (Vanderbilt 301). However, “the hat is no great protector” (Moore 164). When Holden wears the hat to Central Park, chunks of ice still form on his hair, and when he stands in the rain watching Phoebe ride the carousel he states, “My hunting hat really gave me quite a lot of protection, in a way, but I got soaked anyway” (Salinger 212, 213). At this point, Holden begins to realize “that the cap… provides, at best, only a partial protection from the unexpected drenching” (Vanderbilt 301). Similarly, the hat cannot fully protect Holden from the inevitability of growing up and facing the adult world. Critics agree that Holden finally realizes that the hat cannot provide him full protection when Phoebe takes the hat out of his pocket and places it on his head. He does not reverse the hat but leaves it with the peak facing forward, just as Phoebe had oriented it (Vanderbilt 301). According to Foran, the important thing at this moment “is that he stood in that very wet reality, and didn’t care” (Foran 979). Whereas typically Holden would have complained about the rain, or flipped his hat backwards like a baseball catcher, he watches Phoebe and states, “I felt so damn happy, if you want to know the truth. I don’t know why” (Salinger 213). He seems to have given up on his obsession to be the catcher in the rye and just stands for a moment, happy and in admiration of his sister. Vanderbilt suggests that at this point in time Holden may understand that “There can be no protector to break the fall from innocence into adolescence and maturity” (Vanderbilt 301). Embracing his vulnerability to the rain and standing with his hat turned forward, Holden is at the peak of his development in the novel. The red hunting hat aids the bildungsroman aspects of The Catcher in the Rye as the symbol “works unobtrusively to suggest every aspect of Holden’s thwarted search for external reality and private identity” (Vanderbilt 297). By following the symbol of the hat throughout the novel, critics have marked Holden’s development as a character. Thus, Salinger’s use of symbolism allows the reader to gain a better understanding of Holden’s ideological progression and ultimately provides hope that this bildungsroman protagonist may peacefully come to terms with maturity. Bryan, James. "The Psychological Structure of The Catcher in the Rye." Modern Language Association. 89.5 (1974): 1065-1074. Web. 8 Apr. 2013. <http://www.jstor.org/stable/461377>. Chen, Lingdi. "An Analysis of Adolescent Problems in The Catcher in the Rye." Asian Social Science. 5.5 (2009): 143-146. Web. 7 Apr. 2013. <www.ccsenet.org/journal.html>. Foran, Donald J. "A Doubletake on Holden Caulfield." National Council of Teachers of English. 57.7 (1968): 977-979. Web. 8 Apr. 2013. <http://www.jstor.org/stable/812265>. Moore, Robert. "The World of Holden." National Council of Teachers of English. 54.3 (1965): 159-165. Web. 8 Apr. 2013. <http://www.jstor.org/stable/811333>. Salinger, J. D. The Catcher in the Rye. New York: Little, Brown and Company, 1991. Strauch, Carl F. "Kings in the Back Row: Meaning through Structure. A Reading of Salinger's The Catcher in the Rye." University of Wisconsin Press. 2.1 (1961): 5-30. Web. 7 Apr. 2013. <http://www.jstor.org/stable/1207365>. Vanderbilt, Kermit. "Symbolic Resolution in The Catcher in the Rye: The Cap, the Carrousel, and the American West." Western Humanities Review. 17.3 (1963): 271-277. Web. 8 Apr. 2013. <http://salempress.com/store/pdfs/catcher_critical_insights.pdf>.